The University of Nigeria, Nsukka hereby offers Provisional Admission to the following Government Sponsored Candidates into her various DIPLOMA Programmes for the 2018/2019 Academic Session. Visit the University of Nigeria website (unn.edu.ng) or portal (unnportal.edu.ng), log in your form number to generate and download a Payment Invoice which contains a Remitta number, the invoice will enable you to make payment at any Commercial Bank. 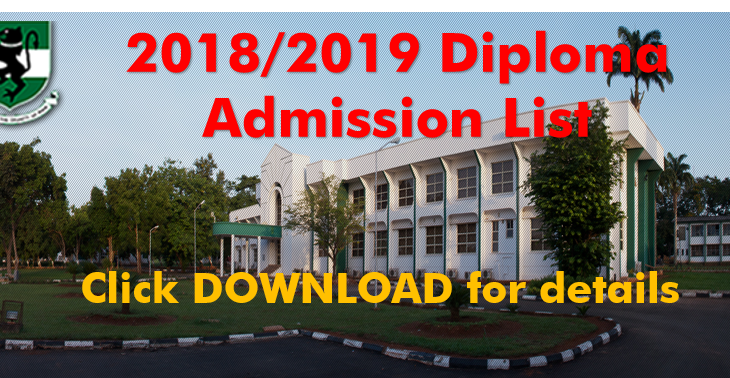 Visit the University of Nigeria website (unn.edu.ng) or portal (unnportal.edu.ng) again and login your Form Number, the Confirmation Number and Invoice Number, then print the Admission slip and complete the Acceptance Form online.